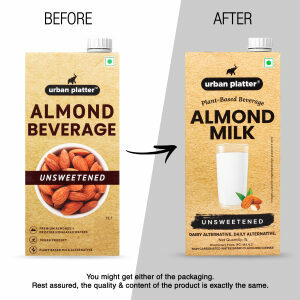 Urban Platter Unsweetened Almond Milk contains Premium Almonds from California and mountain spring water from the Himalayas. Make the switch to dairy-free deliciousness you never thought possible. Our Unsweetened original almond milk is infused with plant-based nutrition to keep you and your family healthy. Every serving pours on 40% more calcium than dairy milk. Plus, our almond milk is naturally high in protein, low in fat and packed with vitamins and minerals. Find yourself blown away by the creamy goodness. Pour it over your favourite cereal, add a dash of it to your coffee/tea or pair a glass of it with a warm cookie.